Even though not everybody gives it a voice, spending a night amidst tranquility of ocean is a reverie. Private luxury Catamaran cruise proffers an overnight yacht stay to let tourists experience the serenity of the Indian ocean at night. Allowing maximum 8 members on board, this cruise could be a perfect choice for families as well as couples. Departure time is two in the noon from Black River Bay from where starts their kingly services. Apart from isolation in nature, this yacht cruise include activities such as snorkeling, Dolphin watching, sail into stunning lagoons, and stop for a mesmerizing tropical sunset. It will give you a feeling of sailing in paradise. An impeccable choice of yacht cruise to enjoy solitary confinement with your loved ones and nature. This yacht cruises all along the west coast departing from Grand Baie, reaching Tamarin Bay, the best place to witness playful Dolphins. The 8 hours of princely amenities include lavish lunch with options of main course and sea food. The most inviting thing about this cruise is that you can tailor make the cruising route according to your preferences. You can stay stationary and relax on board, or go snorkelling or visit palm fringed beaches, it's all up to you. One thing is guaranteed, you will be smitten by the tranquility of turquoise waters of Mauritius. 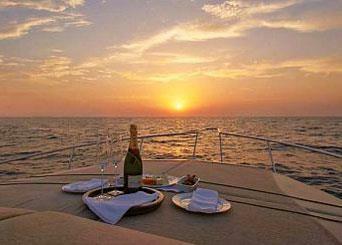 Ultimate yacht charter that offers a sumptuous overnight experience. The stunning design of this yacht provide a spacious staterooms, salons, entertainment space and superstructure windows offering a panoramic sea view. It provides a must-have sophisticated experience that covers incredible beaches, splendid views, and a chance to swim with dolphins. The route includes Flat island, Grand Bay, Tamarin Bay, Benitier island, and Le Morne peninsula. With several meal options and the limit of only 6 guests per cruise make this package is a delight. Enjoy the gorgeousness of Mauritius with Sunseeker Royal Yacht and create memories for lifetime. This is one of the most popular cruises for couples and honeymooners. The motive of this yacht is to take you away from the hustle bustle of the beaches to witness the legendary sunset of Mauritius. You will have your beloved by your side when the sun plays the symphony of colors, a blend of red, purple, blues, pinks, and yellow. After the sunset, you can have a delicious dinner in a romantic setting. Cocktails, drinks, music, lavishly prepared food, and you beneath the stars; sounds amazing, isn't it? Make your partner feel elegantly special even if you are on a non-cruise Mauritius tour package. If it would have been me, I would trade anything to be on the pristine waters of Mauritius. It looks, sounds and feels supremely splendid to be on one of these yacht cruises. Avail luxury Mauritius tour packages that can be customized to make the most of this exotic place.